You can get high two ways in North Adams: on Massachusetts's highest mountain, and on contemporary art and performances. North Adams, a former industrial town in the extreme northwestern corner of Massachusetts 131 miles (211 km) northwest of Boston, at the northern extent of the Berkshire Hills (map), is now know mainly for two things: Mount Greylock, the highest mountain in Massachusetts, and MASS MoCA (the Massachusetts Museum of Contemporary Art). It is a small but pleasant town with a restored and beautified 19th-century Main Street (called DownStreet by locals) grand churches and mansions from the town's 19th-century industrial heyday, and adequate hospitality services, with many more nearby. MASS MoCA's reason for being is to present moern works of art that cannot easily be displayed in traditional museums. Its many renovated factory spaces can easily shelter gigantic works and display them to advantage. 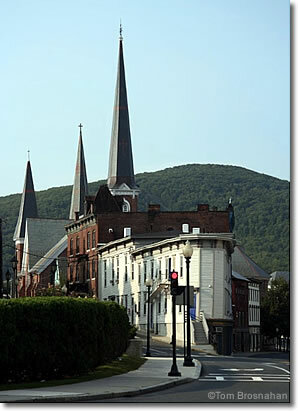 in North Adams MA, looking toward Mount Greylock.